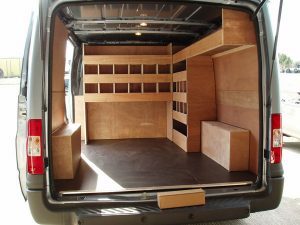 Van ply lining from Fleet Dynamic enables you to protect the inside of van panels. It can also protect the exterior of the panels from damage that is caused when loose loads cause dings and dents. Even the smallest damage can lead to rust and erosion, which will worsen over time. Rusted bodywork not only means extra maintenance and repair costs, but it can leak, causing damage to stock and transported equipment. Rusted panels also mean that the resale value of the van will be diminished, when the vehicle reaches the end of its life. Commercial vans and business vehicles typically represent a significant outlay for a business, and protecting these assets is important. Ongoing maintenance can help ensure that the vehicle is sound both mechanically and electrically. It can help prevent rusting, and it can prevent minor damage from becoming a major problem. However, preventing damage from occurring is the more proactive and affordable approach. Fleet Dynamic offers van ply lining to protect commercial vehicles and business vans. Our services help you to minimise repair costs and reduce the likelihood that you have to replace the van or pay for expensive repairs. Van ply lining services offer an additional layer of protection to a vehicle. Ply lining a van means applying a layer of plywood to the inside of the vehicle. The wood is fixed firmly and the affordability combined with the strength of plywood makes it a convenient choice for this process. Once a van has been lined, it will endure less damage even if you have heavy machinery or heavy items that are not secured properly, and that bang against the sides. 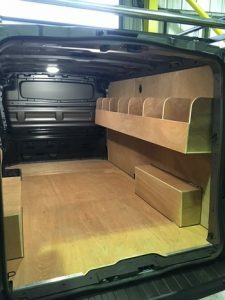 Our van ply lining services are customised to the needs of the individual and to the exact dimensions of the van to ensure the best possible results. The damage from dints and scratches may seem minimal, but the removal of the protective primer and paint from the van panels means that they are more likely to rust and erode. Once a panel starts to rust, even when from a small spot, the problem can quickly worsen. This means that panels lose their structural integrity while the van loses value. With business vans representing such a large investment for most businesses, it is important to protect these investments. There will come a day when the van reaches the end of its useful life and needs upgrading. The better the condition of the van, the more likely you will be able to recoup some of the costs that were incurred when buying it. Fleet Dynamic’s van ply lining services help you retain more of the value in your vehicle while giving it a more professional look. Preventing dints and scratches not only helps protect the value of a van, it can also prolong its useful life. After outlaying such a large amount on a commercial vehicle, you should ensure that you get as much use as possible out of it. Ply lining a van protects the panels. It prevents damage from being caused if your load is not properly secured or if it breaks free. It also protects from scratches and scrapes that might be caused when loading and unloading items into the back of the van. Even a small scratch can lead to rusting and once a panel starts to rust, the problem will get worse. Once panels start to erode, it negatively impacts the protection that the van offers. Rain, dirt and debris can get through the holes that form. This not only exacerbates the problem of rusting but it can also lead to damage to items that are stored or transported in the van. Whether your van is used for delivering products to customers or for transporting machinery to work sites, leaks can prove very costly. Our high-quality ply lining for vans helps to protect your cargo and products. Once the damage has been done to a van, you need to pay for repairs to prevent it from getting worse. Repair costs can be expensive and if you suffer from regular damage then repair costs can become a significant and regular outlay for your company. 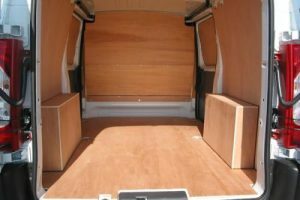 By having a plywood lining fitted by Fleet Dynamic you can reduce or eliminate many of these repair costs, saving you money and time that would have been lost while the van was in for repairs. The thickness of ply lining, the panels that need covering, and the total amount of protection offered determines how much plywood is used. Fleet Dynamic can check your commercial vehicle, determine the best ply lining kit and professionally install it in the back of your van. You can protect your cargo, prolong the life of your commercial vehicles and you can reduce maintenance and repair costs while preventing rust from becoming a major problem. Fleet Dynamic offers a host of fleet management and fleet vehicle services. As well as professional ply lining for commercial vans, we offer car and van rental, full fleet management services, and vehicle wrapping. We also manufacture high quality and durable health and safety signs to help protect your business in the same way we can protect your vehicles. Contact us today to discuss your vehicle leasing, fleet management, and van ply lining requirements.